Oh no!!! Hopefully that's a lesson learned for the next time (or for the next time to not happen as so). I promise never to try to kiss a porcupine. I'm glad Daisy wasn't seriously hurt in her encounter with the porcupline -- those quills look nasty. have a great weekend and Mem. Day. But Janie, porcupines have such velvety soft faces. Daisy just didn't approach it right. Yet hopefully she's learned her lesson. What we call bark on the Aspen is actually the living ploem so many forest wildlife find it apetizing, especially during winter. A good measure of how deep the snow was. Poor dog. Interesting microscope picture. I had read about the barbs on the quills, now I've seen them. OUCH! Poor Daisy.Thanks for the information on porcupines. Fascinating shot of the quill. Poor Daisy! Glad she's ok & definitely hope she's learned her lesson! Nice images of the quills! That's the first close up shot I've seen of a quill too. Ouch! Poor Daisy .. those look very painful !! Poor Daisy, this must have been so painful! Hope she's better now! Oh joy! I am not sure what is worse, an encounter with a porcupine or a skunk. I had a rather dense Irish setter who managed to attract these critters! Thanks for the great photos and post Janie. Ouch poor Daisy! We've had to remove some from our dog a couple of times. Not very fun. Oh wow!! Poor Daisy!! Very informative post - thanks! Have a wonderful weekend! So glad Daisy's dad is a doctor! Poor girl. We know all too well how being inquisitive can lead to trouble. Glad it wasn't any worse than it was. She's wiser now, for sure. the marks on the tree are something else! Janie: What a neat but sad story for your dog. 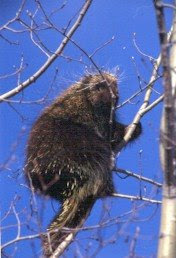 I have seen Porcupine while hunting and they are an unusual animal. I did not know that porcupines could climb. Poor Daisy. It's hard to be friendly to such a prickly critter. ouch poor daisy. i never realised just how long each one is. fascinating post. hugs from london janie. Poor baby. That must have hurt! Wow! I have never seen a porcupine in our area, but they are around. I have often wondered what would happen if the dog found it first. We have had a skunk encounter and that was unpleasant, but not painful like quills. Oh, they sure can cause a painful mess, can't they? Hopefully, Daisy learned her lesson. Oh, poor Daisy! My gosh that looks painful...hopefully she's learned her lesson, although I expect it's hard for her to resist critters of any sort!